Someone emailed me this one. I don’t know if it’s for real. Without the benefit of examining a high-rez version of this picture I just can’t authenticate the cover. In fact this is probably a violation of my “no Photoshop” rule but it’s a great attempt at making a horrible record cover so I’ll look the other way. Jose Angel is no less but a Spanish speaking Christian homosexual. He confesses his faith and sexual orientation to no one else but his mother in the title of this record. Being gay Christian is nothing extraordinary. I’ve known a few. One even stiffed me although not in the way you think. He owes me money for the work I’ve done for him but that’s another story. Jose Angel is different than my less than honest acquaintance. Jose Angel is pure. He is very comfortable with himself. Seated atop a three layer cake of an armchair he’s at peace with his body. I love the chiropractic twist. You can almost hear the vertebral crack. The torso turning counterclockwise and the toebox of his shoe pointing east like a mosque door. Tiny bit of limp wrist really seals off the package for me. Some closets are messy while others are neat. The doors on some squeak and need a lot of lube to open. Jose’s closet burst open with a musical symphony sung by an angel. We can only hope that Jose’s mama received the musical outing well. 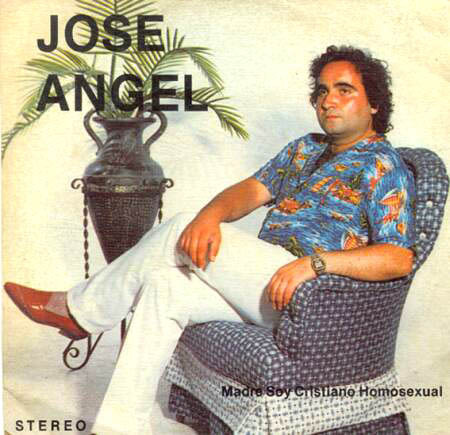 This entry was posted in Records and tagged Bad record covers, christian homosexual, jose angel. Bookmark the permalink.